Russian Foreign Minister Sergey Lavrov has said, in comments carried by Russian agency Tass, that although the BRICS bloc was formed as an economic partnership, the group will also foster political cooperation. “Considering that BRICS represents nations from all developing regions of the world, this is a highly important format to align approaches towards key international problems within its framework,” Lavrov said. 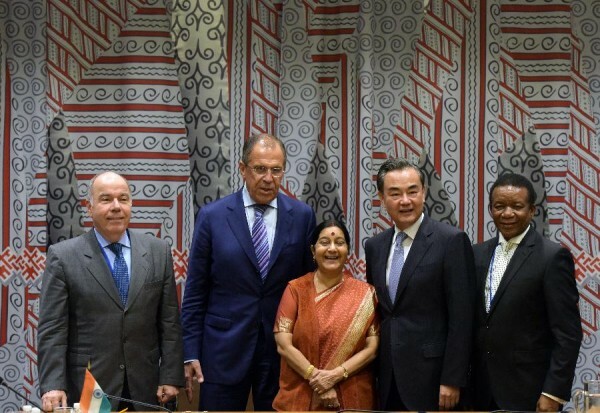 BRICS leaders and foreign ministers have been meeting on the sidelines of major global power events including the G20 summit, the UNGA sessions to coordinate stands. It was other member capitals and not Moscow which initiated talks on political cooperation within the group, according to Lavrov. “Our partners and not we introduced political issues into BRICS agenda and we agreed with that,” he asserted. Russia has been instrumental in boosting intra-BRICS cooperation, with President Vladimir Putin using membership of the bloc to demonstrate Moscow is not isolated even as it battles western sanctions and hostility. “Sectoral interaction will be developed definitely, particularly in the energy sphere, and political cooperation will be strengthened,” Lavrov said on Monday about the group’s future plans. The bloc is not admitting new members at the moment, Lavrov said, although “opinion allies” can cooperate with the bloc in its current form. The BRICS emerging economies launched a development bank at a summit in Russia last year which the group hopes will help reduce Western dominance of world financial institutions. The BRICS account for a fifth of the world’s economic output and 40 per cent of its population. A $100 billion Monetary Fund and a New Development Bank are central to their efforts to reshape the Western-dominated financial system. My gratitude to all BRICS members for their peaceful innovations and forward thinking. Bless you all!